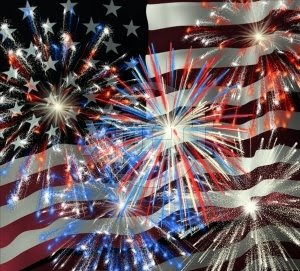 It is NEVER too early to begin planning your holiday patriotic celebrations and 2008 is destined to be a big year for the ole' red, white and blue! Think ahead and start stocking your party closet up now and you'll be ready to celebrate Memorial Day, Fourth of July and Election Day in style this year. For food think strawberries, blueberries and feather-light angel food cake. 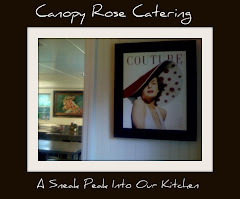 For catering think Canopy Rose! Your office staff can either make you or break you. Naturally, the first option is the preferred option! Whether you want to motivate your staff for what is to come or you want to reward them for a job well done - food is a delicious motivator. 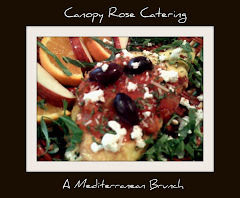 Bring in a catered lunch from Canopy Rose and watch the productivity soar. It never hurts to court, wine or dine those who are important to us and our objectives. As the 2008 legislative session draws to a close, maybe it would be nice to throw a little party to say, "Thank You!" 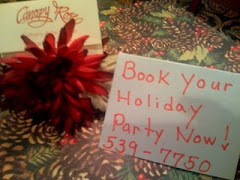 From the Desk of Wendy Creel comes this e-mail about her upcoming class at Canopy Rose. Don't miss this informative class sponsored by New Leaf Market! For directions see below. I wanted to let everyone know that I will be teaching an herb class through New Leaf Market next Thursday May 8th at Canopy Rose Culinary Arts Studio in downtown Havana. 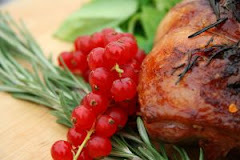 I will be creating "Hawthorn Berry Syrup fo the Heart". This timeless herbal medicinal is used to nourish the heart, repair valves, reduce swelling, restore feeble heart action, and open congested heart blood vessels. This is a "Living heart insurance policy", grow your own new heart and make a tremendous difference in the years to come. Class starts at 7:00PM and cost is $5 members and $7 for non-members. Canopy Rose is located in historic downtown Havana, Florida - a quick jaunt away from Tallahassee. Just take Hwy. 27 (North Monroe Street) and head west past the Tallahassee Mall. Stay on 27 the entire way till you get to downtown Havana. The trip will take about 15 minutes, give or take five or ten, depending on where in Tallahassee you will be coming from and the amount of traffic. 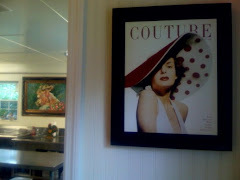 It usually takes me about twenty minutes to drive from the studio in downtown Havana to the heart of Killearn. But if traffic is heavy, the time could be much longer. To be on the safe side- allow extra travel time! When you get to downtown Havana, you can't miss us! Canopy Rose is on the corner of Seventh Ave. and Hwy 27. We are directly across from H & H Antiques and next door to the Havana Herald newspaper. Our building is white on the Hwy 27 side and green marble on the Seventh Avenue side. Come to the doors on the green marble side. 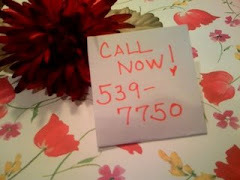 If you get lost, call us at 850-539-7750. 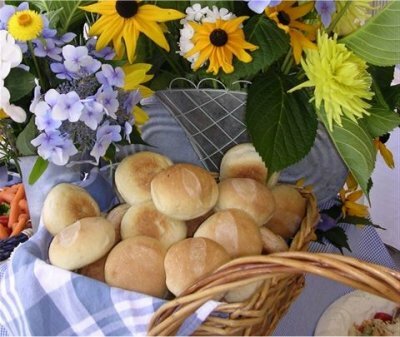 Both veteran and novice capital city area party givers with the role of putting together a party often ask the same question, "How do I go about finding a great Tallahassee caterer?" 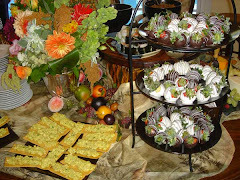 What could be more elegant than a sumptuous Dinner by The Bite Catered Cocktail Reception? In the poetic ambiance of a Tallahassee springtime garden, Canopy Rose creates a dreamy setting for celebrating life's grand moments. Your invited guests will be in delightful awe with this heavenly spread... simply perfect for a bride and groom's wedding day, your grandparent's fiftieth anniversary or any number of other important occasions worth celebrating in high-style. 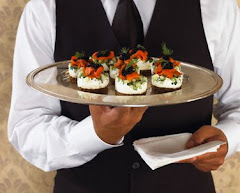 We invite you to peruse a sampling of our lovingly hand-crafted hors d' oeuvres. But please keep in mind, that our culinary repertoire extends far beyond the borders listed here. 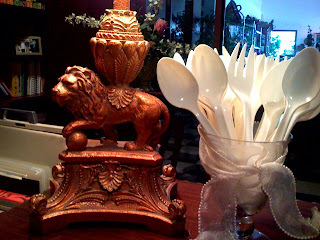 Whether your tastes preferences are Downhome Southern Comfort, Romantic Southern Plantation, Eclectic Elegance or Far-Flung Global Gourmet ... the catering professionals at Canopy Rose are always happy to collaborate with you on creating an individualized menu that works for you and your pocketbook. Bruschetta Bar...Oh my! Your guests will love this station of Tuscan Toasts and bejeweled toppings with an Italy meets Deep South Flair. A tried and true classic twelve months a year! Rich, irresistible and oh so very elegant. Mmmmm! Pretty and simply melt-in-your-mouth delicious! Who can resist the extravagance? Not I! These wonderful little bites add a special touch to cascading fresh fruit displays. Ladies that lunch love these! 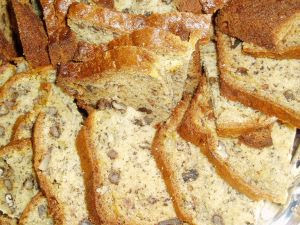 The recipe we used when we served these in the 1990's at a soiree at the Florida Governor's Mansion. Vintage Cuisine Recipes From Our Culinary Archives! Always popular and oh so good! Lovely to look at and lovely to eat! What is a Florida Reception without our magnificent Gulf Coast Seafood treasures? From the glorious Greek inspiration that has contributed a wealth of delicious flavor to the culinary world! 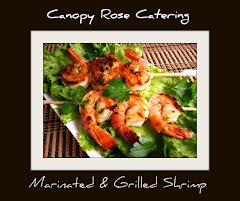 Canopy Rose, a Florida DBPR state licensed and fully-insured caterer is pleased to offer the following lunch and dinner menu selections for May 2008. Please keep in mind that this is only a partial listing of what we offer. 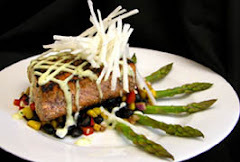 We are always happy to custom-design menus based on our client's taste preferences and budget. For immediate assistance please call Kathi at 850-539-7750. A great lunch begins with at least one beautifully prepared garden fresh salad. At this time of the year, Canopy Rose Salad Platters make for crowd pleasing office lunch offerings. Just about everyone is watching what they are eating these days. So why not offer them something that will help them to feel good. Canopy Rose Office Catering Trays are the perfect solution for Breakfast, Lunch and Dinner meals in any work environment. 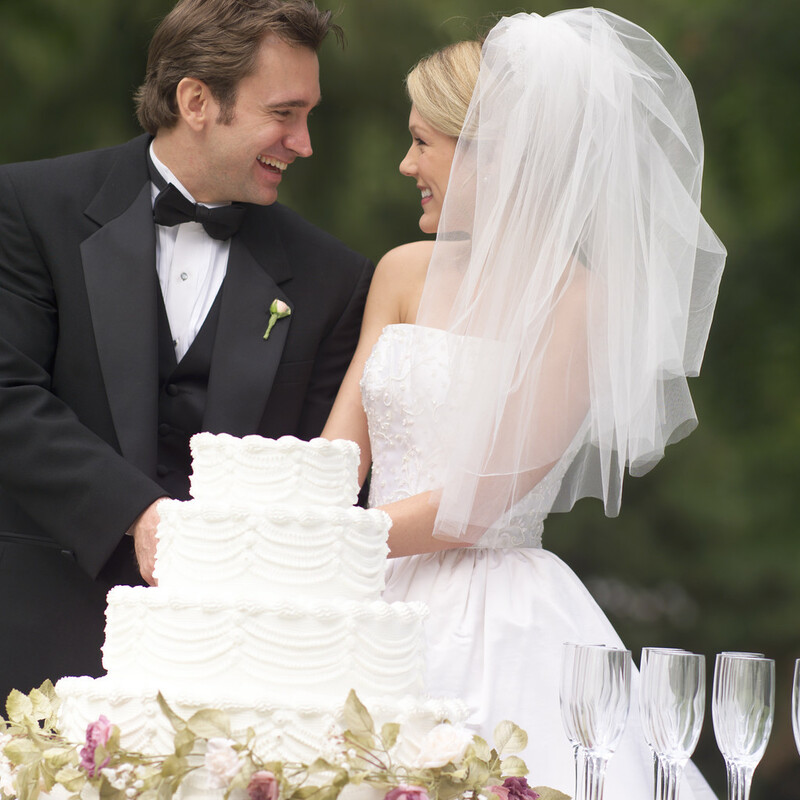 Choose from the suggestions listed here or call us at 850-539-7750 and let us custom-design a menu based on your taste preferences and event budget. Please keep in mind that the following list is only a brief sampling of our delicious offerings. 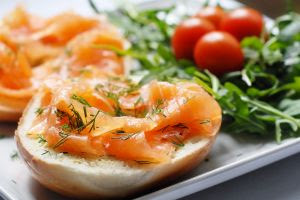 A delicious assortment of fresh bagels and morning pastries. Served with cream cheese, sweet butter and preserves. Assorted fresh seasonal fruits attractively displayed. The Perfect splurge for special meetings! Accompanied by a basket of bagels. Savory and delicious fluffy egg-based breakfast entrees filled with flavor-rich ingredients sure to please the toughest critic. Light and fluffy and delivered to your office piping hot. An American favorite! Who can resist this savory morning time casserole? Order double... it disappears fast! A true Tallahassee breakfast should include a loving spoonful of Bradley's Grits! We slow cook this local treasure with chicken stock, onions and garlic. Before serving we add a whirl of cheddar, dairy cream, butter and chopped green onions. Takes you back to the good ole' days! 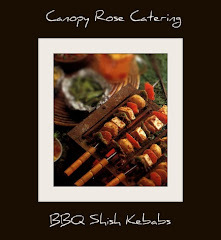 This menu was created by Kathi Dameron of Canopy Rose Culinary Arts Studio and Catering Company on April 29, 2008. 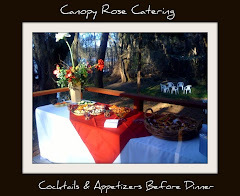 Canopy Rose is a fully DBPR licensed and insured Florida catering company that serves the communities of Tallahassee, Havana, Quincy, Monticello, Crawfordville, St. Marks, Panacea, Bainbridge, Thomasville and other nearby business communities in North Florida and South Georgia. Our catering is not limited to offices. 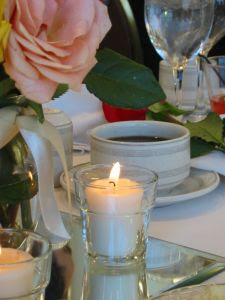 We also cater social events such as weddings, rehearsal dinners, anniversaries, graduations, birthday parties, political fundraisers, etc. Centrally located in historic downtown Havana, Florida. We get this question often. People are curious about who it is that is responsible for promoting Canopy Rose. We are very fortunate to have a very special relationship with our publicist. 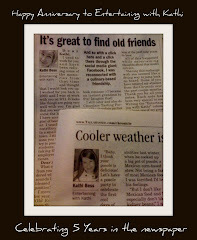 Our publicist is Kathi Dameron - Kathi Dameron & Associates. Both businesses share the old Havana bank building in downtown Havana, Florida and both businesses are owned by Kathi Dameron. Crisp, beautiful, anti-oxidant rich garden fresh gourmet salads are an ideal lunch time food offering for business and social luncheons. 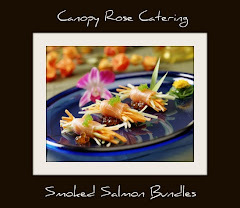 For a catered lunch selection that will dazzle your guests, clients or staff ~ call on the culinary artists of Canopy Rose Culinary Arts Studio and Catering Company to deliver a meal that will surely tickle the tastebuds. 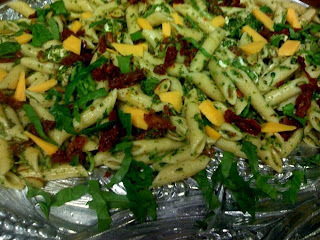 Why not begin your catered event with one, two, three or more of our salads! Here are just a few of our most popular selections. Please keep in mind that this list is only a small sampling of the almost unlimited customized food options that are available from this favorite regional caterer. 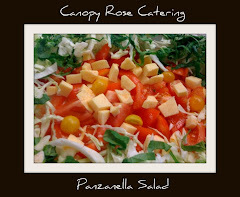 This gorgeous salad became one of Kathi Dameron's most often requested salads during the first Canopy Rose tenure. Even after a brief hiatus from the catering business, former clients still wax poetic about this luscious salad and ruby-red and black speckled dressing. Needless to say, everyone we know is applauding our return to the catering and special event arena and we are thrilled to be back! There is a priceless joy to hearing you sing our praises, because making your taste buds dance with glee is high on our list of objectives. Kathi's favorite! Simply delicious! All sorts of crisp greens, colorful fresh veggies, a generous mound of Kathi's homemade potato salad, assorted olives, feta cheese and accompanied by Kalamata Olive -n- Herb Vinaigrette. Can be ordered with or without seafood. This one is our version of a Tallahassee, Florida favorite. We discovered this recipe back in 1988 in "Thymes Remembered" ~ the Tallahassee Junior League cookbook. It's been a keeper ever since! This is a popular salad for elegant spring and summer lunches, brunches and dinners. 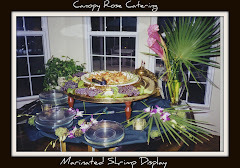 We like to add a generous catch of Apalachicola Shrimp to the salad, along with some unique Canopy Rose touches. The composition of yellow saffron rice, marinated tomatoes, assorted veggies, chicken, and olives is dressed with a delightful spritz of homemade tarragon vinegar. Beautiful and bodacious and filled with a bounteous bevy of goodies. 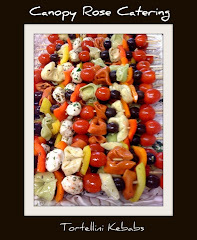 Italian antipasto meets Florida Gulf Coast in this crowd pleaser that will satisfy even the most robust of appetites. 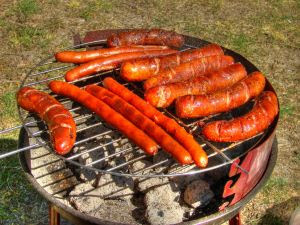 Lots of assorted marinated meats, cheeses, veggies and mushrooms tossed with lip-smacking good tortellini, herbs and our region's fabulous Florida seafood. 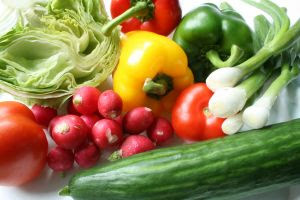 A glorious light, heart-healthy composition of colorful and crunchy garden-fresh veggies presented with style and pizzazz. 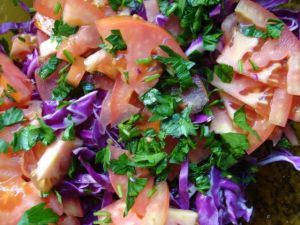 This is a perfect salad for vegetarians and spring-time dieters. Served with one of our delightful sunny Florida-inspired fruit-kissed vinaigrettes. For the sandwich lovers we offer your choice of our delicious hand-mixed Canopy Rose Chicken Pecan Salad, White Albacore Tuna Salad with Capers and Parmesan Garlic Mayo, Turkey Salad or Southern-By-The-Grace-of-God Ham Salad that can arrive at your event pre-assembled on delicious sandwich breads or in an elegant mound surrounded by clusters of red and green grapes and accompanied by baskets of fine breads. Lots of offices like the second option, which allows their staff the freedom to add additional protein to the meal with or without the bread. Of course, mile-high deli sandwiches with Boar's Head Brand Meats and Cheeses, Big Kosher Dill Pickles and assorted chips are also available, too. 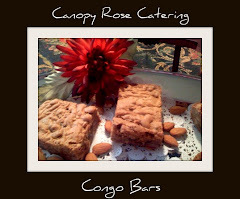 For dessert we offer easy to pick up and eat home-made cookies, brownies, congo bars, etc. But our offerings don't stop there. 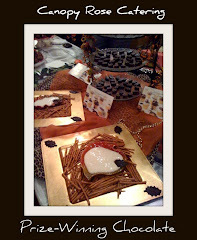 Many of our clients like to go all out with a spectacular dessert extravaanza! These might include A Death-By-Chocolate Buffet, An Ice Cream Sundae Buffet, A New York Cheesecake Buffet, A Country Pie Buffet or .... you get the idea! 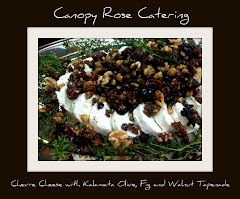 With Canopy Rose your options are unlimited, but Kathi will be happy to cut through all the difficulty of choosing a menu and pull together a menu just for your group that will fit your budget to the T.
Whether you are looking for a lovely cool and crisp seasonal spring / summer salad or sandwich sampler buffet or something substantially hearty and hot, the crew at Canopy Rose can help you to host a flavor-popping catered event. Contact Canopy Rose at 850-539-7750. We are located a very short drive from Tallahassee Florida, Quincy Florida, Bainbridge Georgia, and Thomasville Georgia. 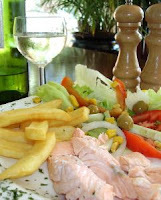 Our fully licensed and insured kitchen is centrally located in the quaint and historic town of Havana, Florida. We are in the old Havana Bank Building. Canopy Rose has one of the most generous pay scales of anywhere in the industry. 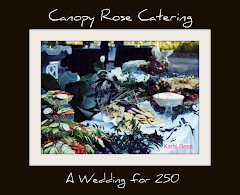 CEO, Kathi Dameron designed the payment plan after taking a sabbatical of sorts from owning Canopy Rose Catering, a premiere North Florida catering and special event company that catered to the Who’s Who of Florida for over a decade. During her sabbatical, Kathi had the opportunity to work as an employee on a couple of different occasions and was able to see things from an entirely different perspective. What she saw was that many businesses are not fair to the staff who are the real backbone of the business. This enlightened advocacy viewpoint is the basis for a unique employee pay incentive structure that not only trains, supports and empowers the staff of Canopy Rose Culinary Arts Studio and Catering Company but also generously rewards them for their hard work, dedication and commitment to culinary and special event excellence. 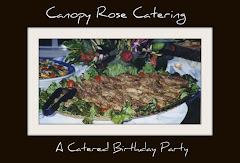 Event staff at Canopy Rose earn between $10.00 to $25.00 per hour. Once a member of the Event Staff attains the $25.00 cap, they will become eligible for company bonuses, which is another great incentive and reward for valuable contributions in building a great business. 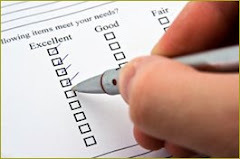 Confidentiality – It is an honor and a privilege to cater to our clients. 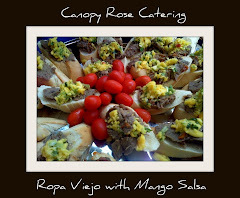 As a team member of Canopy Rose Culinary Arts Studio and Catering Company you will be expected to treat ALL details about our catered events as confidential information. Professionalism ~ Staff are expected to conduct themselves in a professional manner at all times. Please review the company handbook for a more detailed discussion of staff expectations, etc. 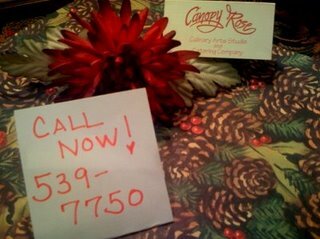 For more information about becoming an event staff team member of Canopy Rose, please contact Kathi Dameron at canopyrose@aol.com or at 850-539-7750.